Use your smartphone or tablet fingerprint reader as a login credential. Encrypt and decrypt files without usernames or passwords. More easily secure your data and your log in credentials without disrupting the flow of business. Qondado delivers industry standard encryption as well as biometric authentication without the need for a username or password. We deploy our solutions in the most easily adopted designs yet presented to the market by leveraging technologies that are known and already in use. 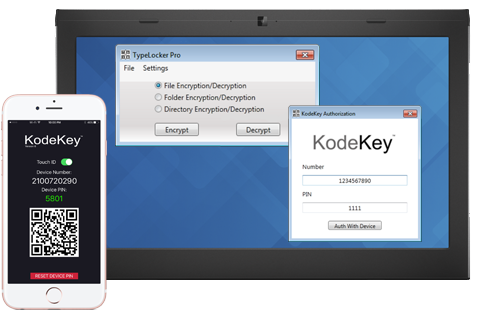 KodeKey™ – The Android and iOS App, and the public authentication system which utilizes the fingerprint reader on smart phones or tablets as a login or authentication credential. Deploy a biometric authentication factor to replace a username or password or a second factor Read more..
Easy AES 256-bit level encryption maximizing data protection and authentication. Encrypt individual files, folders or nested directories utilizing our proprietary algorithm to assign permissions without usernames or passwords. Optional KodeKey™ fingerprint decryption authentication. KodeKey™ or TypeLocker™ Consulting and Integration Services – We offer custom development services for integrating our authentication or encryption technology into other applications. Deploy our proprietary technology seamlessly into the resources and applications your customers and employees already know and use. Add smartphone leveraged fingerprint authentication as a login for your database or cloud deployed application. Add a layer of encryption to your document management system. Encryption as a Service (EAAS) via TypeLocker™ – Deploy TypeLocker to encrypt a subset or an entire share on your network with AES256 level encryption. Decrypt those files on demand without the need for a username or password. Also leverage the ability to require physical device control and biometric authentication for sensitive document decryption. TypeLocker Encryption as a Service delivers all of these possibilities and more. TypeLocker encryption can be deployed as a cloud based or on premise service. Contact us to find out more. Leverage our expertise in encryption and authentication to solve your toughest related business technology problems. Our Consultants have years of experience in data management, regulatory compliance and legal technology. Contact us for a no cost assessment of your needs. Get your KodeKey API Key today. Got #Auth needs? We can help. Please fill out the contact form and we'll be in touch.